There is much discussion on our way to Nungambakkam, about what a grizzler is. With everything from grass to a grizzly bear on our minds, we enter the restaurant to find that it is as simple as grills meet sizzlers. On the first floor of a new commercial building on Jaganathan Road, the 72-cover DGa��s Grizzlers is running a buffet trial on the night of our visit. Of course there are no sizzlers on the buffet menu yet, so we plead with chef Gopinath Palaniappan, formerly with Carnival cruises, who gives in and pulls out all the stops. Some Continental, a little Asian and a good measure of Indian a�� they seem to have the right mix in place. 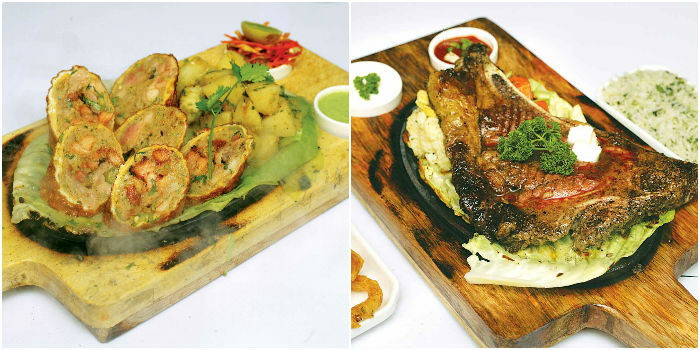 Going by the chefa��s recommendation, we freeze on two of their popular sizzlers before tucking into our soup. The lamb Scotch broth has our complete attention as we scoop up bits of tender lamb with diced carrots, beans, zucchini and more. We then decide to inspect the buffet line up while we wait for our sizzlers. 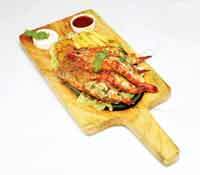 The juicy tandoori basa tikka and crumb-fried chicken tenders look irresistible and we plate a few starters. To our surprise, it is a vegetarian channa hara tikka that has us going back for seconds. While the tenders turn out cold and unimpressive, the basa is full of flavour, but the pasty channa patties are addictive with their delicate mint and yoghurt chutney. The sizzlers finally arrive and we find no comparison between the tandoori ke nazare and the chermoula herbed crumbed sole. The former has smokey pieces of tikka and malai chicken encased in an omelette-like shell of egg and minced chicken, spiced with green chillies. Again, a dash of that delicate chutney gives the dish an altogether new flavour. As for the sole, we have no qualms with the chermoula marinade, but it could do without the dash of Thai sauce that we find on top of the fillet. After this elaborate meal, we settle for a humble almond cake dusted with icing sugar, and while they need to tweak a few small glitches, for now wea��ll say that Grizzlers has potential.